Rocky the sea lion, a resident of Long Marine Laboratory for almost 20 years, died peacefully on November 9. She was about 28 years old, a ripe old age by sea lion standards. Rocky gave researchers new insights into sea lion biology and delighted thousands of visitors to the lab. Ronald Schusterman, an adjunct professor of ocean sciences who retired in 2003, began working with Rocky in 1978 and brought her with him when he came to Long Marine Lab in 1985. Schusterman's research focused on the sensory and cognitive abilities of pinnipeds (seals and sea lions). 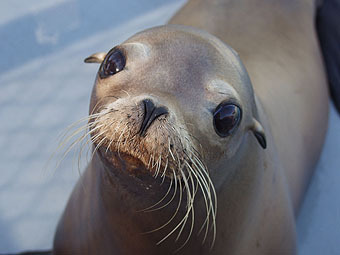 Rocky took part in the Schusterman lab's landmark studies of sea lion abilities in the areas of acoustic perception, artificial language comprehension, associative learning, concept formation, and memory. Colleen Kastak, a research biologist who earned her Ph.D. with Schusterman and now helps lead the pinniped research program at LML, announced Rocky's death in an e-mail to LML faculty and staff. She said that Rocky's endearing personality left its mark on all who knew her. "Rocky captivated children, visitors, students, and scientists with her grace and good nature," Kastak wrote. "She patiently taught us not only about her kind but also about ourselves. She gave us a glimpse of the world as she experienced it. She influenced those whose lives she touched to be more curious, more compassionate, kinder, and more patient. She was a remarkable individual and her life made a difference."